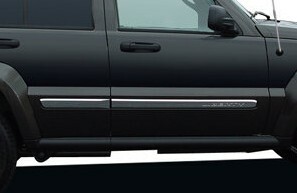 Replace your black side moldings with chrome side moldings for the Jeep Liberty. Same as the Limited model. Chrome Side Moldings. Set of 4. Moldings can be ordered individually at the Accessories tab above.